As we already know that Apple and Samsung are the biggest rivals in the smartphone department, its time for us to compare which company's flagship is better. It's the iPhone 6 vs Samsung galaxy S6! Metal rules for both of the devices at the end of the day. The upgrade of i6 over its predecessor its pretty minor compared to the Samsung Galaxy S6 over its predecessor. Samsung, where it used mostly plastic for their phones now they changed it completely with their new flagship. The S6 has a two piece body with corning gorilla glass 4 on the front and the back with metallic trim on the side. As for iPhone 6, Apple is still struck with the premium aluminium built which I feel is pretty durable and tough. Galaxy S6 - Equipped with a 5.1 inch Quad HD (2560 x 1440) Super AMOLED display, the Samsung Galaxy S6 provides an impeccably sharp viewing experience, and its adaptive display provides unbeatable clarity. Galaxy S6 undoubtedly has the best display compared to any other android smartphone at time in the market. iPhone 6 - Apple always deals great when it comes to the display. iPhone 6 has new, higher-resolution (1334×750) 4.7 inch Retina HD display. With innovations that deliver higher contrast, dual‑domain pixels for more accurate colour at wider viewing angles, and an improved polariser, these are the thinnest, most advanced Multi‑Touch displays Apple has ever made. Galaxy S6- The Galaxy S6 runs on Android v5.0.2 (Lollipop). It is powered by a Exynos 7420, quad core 1.5 GHz cortex-A53 & quad core 2.1 GHz cortex-A57. It's boosted with 3GB of RAM and is available in 32/64/128 GB variants. There is no external slot for micro SD card. Galaxy S6 is one of the fastest phone currently in the market. iPhone 6- The iPhone 6 runs on iOS 8 and can be updated to iOS 8.3. It is powered by a Apple 1.4 GHz Cyclone A8 Dual-core processor (ARM v8-based) and is boosted with 1GB of RAM. The iPhone 6 already proved to be the speed kind scoring high on benchmark tests and also many App opening tests. No doubt it's one of the fastest phone in the world. 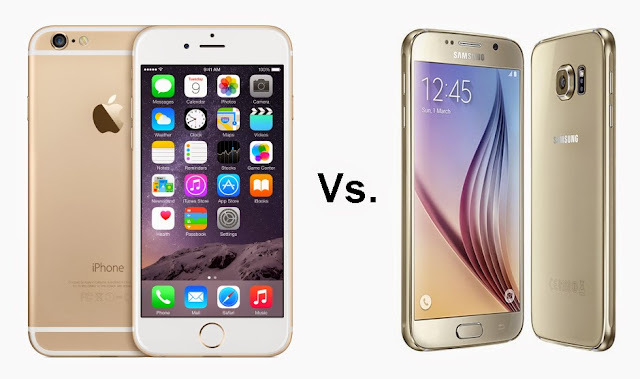 iPhone 6 and the Galaxy S6, both have the best Cameras compared to any other Smartphone. Both of them produce higher quality images with sharp colour production and warm colours. Galaxy S6 - The Galaxy S6 has a 16MP primary shooter (2988 x 5312) pixels with optical image stabilization, autofocus, LED flash, Geo-tagging, touch focus, face detection, Auto HDR, panorama. The camera also supports 4K recording. The front-facing cam however is a 5MP shooter with Auto HDR mode. iPhone 6- The primary camera has a 8 MP, (3264 x 2448 pixels) shooter with phase detection autofocus, dual-LED (dual tone) flash, geo-tagging, simultaneous HD video and image recording, touch focus, face/smile detection, HDR. Because of the low mega-pixel count its not compatible for recording 4K videos. It has a 1.2MP shooter in the front with face detection, HDR mode. Both the devices support biometrics that is the fingerprint scanner on the home button. The Galaxy S6 has a Non-removable Li-Ion 2550 mAh battery and the iPhone 6 has a Non-removable Li-Po 1810 mAh battery. Both the iPhone6 and the Galaxy S6 suffer when it comes to the battery longevity. The iPhone 6 is available is 3 colour variants. They are Space grey, Silver and champagne Gold. The Galaxy S6 is available in 4 colour variants. They are White Pearl, Black Sapphire, Gold Platinum and Blue Topaz. Both of them cost nearly the same price and fall in the expensive smartphone bag costing more than Rs.50,000 in all the variants. So, which phone is better according to you? We would love to hear your comments/opinions about the iPhone 6 & the Galaxy S6! See you in the discussion section!